The CPMR’s members Noord-Holland and the Welsh Government have signed a ‘Declaration of Friendship and Solidarity’, expressing their desire for continued cooperation and collaboration after Brexit. 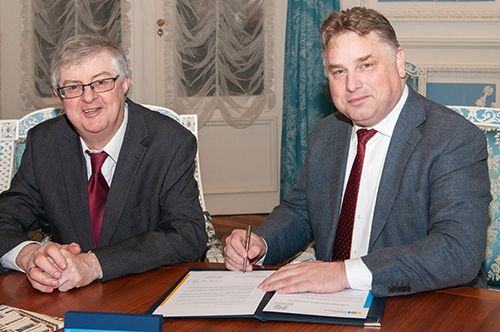 The Province of Noord-Holland’s Regional Minister for European Afffairs, Cees Loggen, and Welsh Cabinet Secretary for Finance and Local Government, Mark Drakeford, signed the declaration in Haarlem, Noord-Holland, on Friday, 13 April. They are urging other EU and UK Regions to add their signatures. The declaration says the Welsh Government and the Province of Noord-Holland are concerned that Brexit coud lead to further divisions across Europe if it is not managed effectively. They draw particular attention to the historical reminders of Europe’s violent past, including the First and Second World War, and express regret that many European citizens feel alienated as a result of the imbalanced impacts of globalisation. In the spirit of the CPMR’s Cardiff Declaration, the Welsh Government and the Province of Noord-Holland affirm their desire for “strong solidarity and friendship between the nations and regions of Europe, those in the UK, the EU27 and beyond, knowing that the best way to defend national, local and regional interests is to continue to work together”. They also affirm their interest in encouraging and facilitating exchange, cooperation and learning between nations and regions, through collaboration in areas such as schools, universities and research institutions; health, social care and third sector organisations; business; politicians, political institutions and government bodies. In addition, they commit to developing a new shared identity beyond Brexit, grounded in regions and cities, promoting openness and tackling racism and xenophobia, building economic cooperation, developing ways of working which benefit citizens and protect the environment, and working together through EU programmes and other multilateral mechanisms, such as the CPMR. Welsh Cabinet Secretary for Finance and Local Government, Mark Drakeford, said: “The Declaration of Friendship and Solidarity with Noord-Holland underlines our desire to grow our bilateral relationship with the province, and supports our wider efforts to strengthen relationships with European regions beyond Brexit. Read the ‘Declaration of Friendship and Solidarity’ here.